Training sessions last approx 90 minutes. Please aim to arrive ahead of time if possible to warm up and help unload the boat. You should bring a bottle of water, sun protection & wear comfortable clothing and footwear. You will get wet so a change of clothes and a towel may be handy. It is also expected that everyone help pack up the boat after a session so that the boat tower can get away promptly. Daylight saving determines our change of season, refer to session page for change over. OTW means "On The Water"
Saturday: Bellinger River, Mylestom Boat Ramp opp. North Beach Bowling & Recreation Club. 8am OTW 8.30am technique training for new & social paddlers. 4.30pm for OTW 5.00pm. Training 1 hour. 8am OTW 8.30am technique training for social & new paddlers. 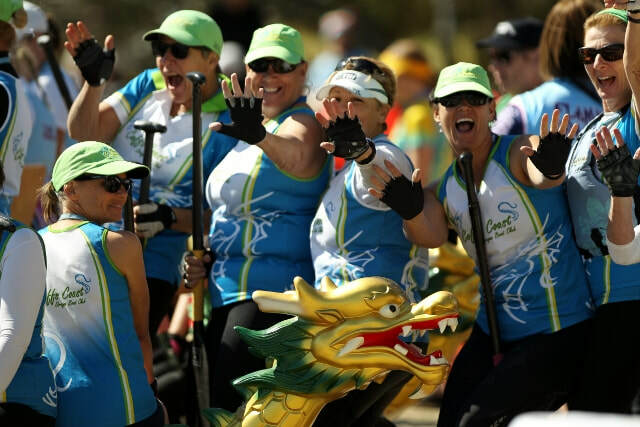 Saturday: DACC paddle Second Saturday of the month at Mylestom 8.00am OTW 8.30am. In addition to the above sessions there will be social, Come & Try Days and marathon training. Please check website Session page for times & dates.